An increasing number of upscale San Francisco restaurants are trying something new: do-it-yourself dining. Patrons walk in the establishment’s front door and take a number. When their number comes up, they go scout out their own table, fill their own water glasses, get their own alcoholic beverage and retrieve their own tableware. Someone brings their food from the kitchen, but that’s about as much traditional service as you get. The reason restaurants are trying this approach? Staffing. In one of America’s most expensive cities, finding people to fill these jobs has become increasingly difficult. To attract staff, restaurants have to pay a so-called living salary. Even a US$15-an-hour minimum wage doesn’t qualify in a city such as San Francisco. To pay a restaurant full of servers making a wage they could realistically live on – something in the US$20 an hour range at a minimum − jacks up costs exponentially. It’s easier for a restaurant to just get rid of servers and rely on its reputation for making great food to bring in customers. 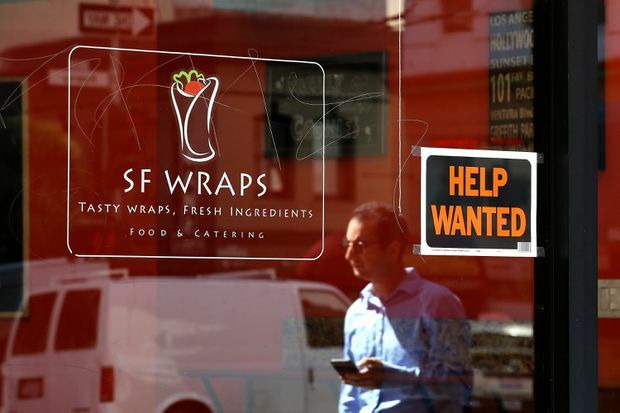 A help-wanted sign on the window of SF Wraps in San Francisco in June. This is a concept I wouldn’t be surprised to see restaurants in Vancouver trying soon. The service industry in Canada’s priciest city is in crisis, with dining establishments, in particular, in trouble. Walk down the city’s famed Robson Street, and you’ll be shocked by the number of Help Wanted signs you see outside restaurants and clothiers. The culprit is housing. It’s far too expensive for someone operating on a server’s wages to even contemplate buying in the city. And now it’s even too expensive to rent – that is if you can find a place. The cost of a rental apartment in Metro Vancouver has gone up two to three times the rate of inflation over the past decade, according to an analysis done by Statistics Canada with data from a Canada Mortgage And Housing Corp. Rental Market Survey. Things have become so bad that even professional athletes are finding it difficult to find accommodations. BC Lions offensive lineman Jovan Olafioye took to Twitter this week to plead with the public to help him find a two-bedroom rental unit for himself, his fiancée and two children. He said he’d even throw in a pair of season tickets. Young people who normally fill service industry jobs are moving to the outer edges of Metro Vancouver to find reasonably priced lodging. They don’t want to commute into the city to work a restaurant shift that might end at 1 a.m. They can find an eatery or bar closer to home. And there doesn’t appear to be any relief on the horizon. A new report by Royal Bank says housing affordability in Canada worsened in the first quarter of this year. This is based on the proportion of median-tax household income needed for mortgage payments, property taxes and utilities. Home ownership costs in Greater Vancouver achieved a record high of 87.8 per cent. The answer to this dilemma may be offering developers incentives to build more rental housing. Some cities in the European Union have up to 60 per cent of households in rental accommodation. Vancouver could soon become a city very much like that. Otherwise, young people are going to continue to desert the place, or move further away from the downtown core to find housing that is more reasonably priced. And there goes the serving class for all the rich folk who can actually afford to buy in the city. If Metro Vancouver wants to glimpse into the future, it need look no further than the San Francisco area, where out-of-control housing costs are destroying the fabric of the area. A recent survey by the Bay Area Council showed that 46 per cent of residents who responded said they plan to leave the area in the near future. That’s up from 40 per cent last year. Even if only 50 per cent of those people made good on that promise, it would mark an exodus of shocking proportions, one that would have enormous social and economic repercussions.